Consider carefully your child’s strengths; provide compliments and encouragement for these areas. Examine your child’s weaknesses, find out the reason for the lack of achievement in this area and determine ways to alleviate the problems. Be patient with teachers and try to develop a good parent/teacher relationship. It is your responsibility to set up communication and continue to keep in touch over time. Also remember that information is not always passed from teacher to teacher or school to school. Within secondary school it is also important to know the year level coordinator and all the subject teachers. Stay calm and be diplomatic when speaking to teachers, your worries and anxiety for your child’s progress will be apparent but be considerate of their schedule too. Teachers have a whole class of children to look out for and limited time to give special attention to an individual. For this reason, some schools will offer an in class aid to assist your child in understanding and keeping up with the class work. Keep an eye out for signs and symptoms of stress. At school classmates will call them “dumb” or “stupid head” and even some adults may label your child “lazy”, “not trying” or “a daydreamer.” Children quickly grow to dislike teachers that ask them to read aloud in front of the class or use their work as an example for ridicule rather than praise. When frustrations are a part of their daily life children quickly adapt to either accept them or avoid them. behaving badly in the hope that punishment means getting out of doing the work. Signs of stress to watch for can be as severe as bed wetting, nail biting, migraines, insomnia or even eating disorders. A child may become introverted and depressed or show aggression and anti-social behaviour. Not all of these problems are caused by dyslexia; however it can be a contributing factor in a child’s level of stress and anxiety on a daily basis. It is important to also be aware that not everyone will have an understanding or sympathy for someone suffering with dyslexia. Not every school principal, teacher, GPs etc will be trained in how to identify and assist your child. Dyslexic children are highly intelligent, although they cannot show it academically. They will be masters of social manipulation and covering up their struggles. There will be times when you must decide if the work really is beyond their means or are they just pulling your leg to get out of doing the task. They may say “I’m dyslexic so I can’t do it,” never agree with such a statement. Simply retort “Yes you may be dyslexic but that just means it may take you a little longer to finish and I may have to help you a bit.” Be firm but positive, “I know you can do this, have a go.” Be understanding of the amount of effort required for your child to complete tasks, make sure they get regular breaks so they do not feel overwhelmed by their workload. Utilise the television. 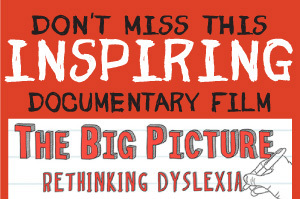 Documentaries and film adaptations of books are a great way for dyslexics to absorb the information as it is displayed in a visual, frame by frame medium. Be involved in physical activities such as cooking, fishing or carpentry. These skills may later prove invaluable in the workforce. Take them to museums or on holiday and have them document their experiences. The most important part of parenting a dyslexic child is to be understanding. Education doesn’t only come from books so seek a good balance of studies and life experience.